The event explores the different applications of anthropology beyond traditional academia. 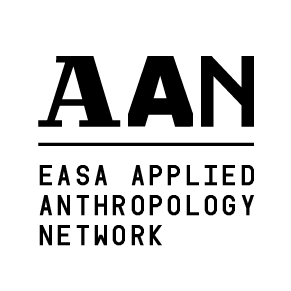 Attracting more than 2900 participants, the flagship event of EASA Applied Anthropology Network has been providing a platform for opening-up the anthropological discipline since 2013. The two-day symposium regularly offers different thematic focus. In 2013, we identified “New Fields for Applied Anthropology in Europe”. One year later, as we discussed cooperation between academic and applied anthropology, the event was titled “Coming out of the Ivory Tower”. In 2015, 450 people attended the symposium in Ljubljana on „Burning Issues of our Hot Planet“. In Estonia, “Nordic Silicon Valley”, 350 people made a move to “Humanise IT“ in 2016. One year later, we looked into sustainable energy solutions during “Powering the Planet” event in the UK. Finally, last year, we inspired 300 anthropologists and designers to create new collaborative partnerships at “Designing the Future” in Lisbon. Touring six European countries, WWNA presented work and visions of 19 plenary speakers practicing anthropology in and outside academia, including Jitske Kramer (HumanDimension), Rikke Ulk (Antropologerne), Genevieve Bell (Intel), Thomas H. Eriksen (University of Oslo), Melissa Cefkin (Nissan), Daniel Miller (UCL), and Sarah Pink (RMIT University). During the first day, while being broadcasted online, WWNA concept revolves around 4-5 plenary talks delivered by leading scholars and practitioners, and the final panel discussion. During coffee and lunch breaks, participants engage with app. 15 Hotspot presenters in a fair-like setting. During the second day, WWNA offers 10-12 hands-on workshops, Perspectives: Powered by PechaKucha session and concluding Plenary Session with discussion. The third, extra day, is dedicated to Applied Anthropology Network meeting and free guided tour. The Coordinator is a Convenor who serves as the main organization lead for the annual symposium. He or she manages members of Organising Committee and communicates key messages between the team and AAN convenors. Hosted by the city of Lisbon and supported by wide coalition of partners, the sixth edition of „Why the World Needs Anthropologists“ focused on design anthropology, methods and practical applications, and its potential for framing the future of humanity around the world. On 26-28 October, 300 participants from 33 countries (160 trained anthropologist, 140 trained designers) engaged in the timely conversation around the key message of "Designing the Future": stop accumulating “knowledge” and start making “things”. Prof. Miguel Vale de Almeida and Prof. Rosa Maria Perez (ISCTE) welcomed our guests in beautiful Museu do Oriente. The Plenary Session presented José Manuel dos Santos (Signify), Sarah Pink (RMIT University), Jamer Hunt (Parsons School of Design) and Anna Kirah (Design Without Borders), as well as Design Hotspot area with 16 companies and institutions who offer and/or seek the expertise of design and anthropology. On the second day, the record-breaking 13 Workshops and innovative "Perspectives", PechaKucha-like speedtalks, opened the floor to the audience. Finally, WWNA 2018 was crowned by the session with a former AAA president Prof. Alisse Waterston. The free-of-charge event run on voluntary basis was financially supported by 27 partners and 14 local volunteers. The videos are available here: http://www.applied-anthropology.com/video/. Keynote speakers: Benj Sykes, UK Country Manager of Ørsted, Tanja Winther, Associate Professor at Centre for Development and the Environment of University of Oslo, Sophie Bouly de Lesdain, Expert Researcher at Electricité de France, and Veronica Strang, Executive Director of the Institute of Advanced Study at Durham University. 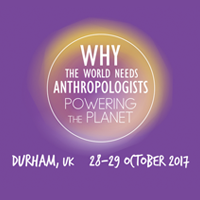 On 28 and 29 October 2017, EASA Applied Anthropology Network co-organized the fifth edition of the annual symposium „Why the World Needs Anthropologists“ for 273 registered participants entitled „Powering the Planet“ in Durham, UK. Whereas the aim was to promote applied anthropology in Europe and to explore how energy professionals can cooperate with anthropologists to design and deploy energy innovations, among seven other organising partners, the key role of the event host was assigned to Durham Energy Institute. The four speakers presenting at Durham University were Benj Sykes, UK Country Manager of Ørsted, Tanja Winther, Associate Professor at Centre for Development and the Environment of University of Oslo, Sophie Bouly de Lesdain, Expert Researcher at Electricité de France, and Veronica Strang, Executive Director of the Institute of Advanced Study at Durham University. Energy Hotspot with exhibition stands of seventeen companies and institutions provided information on job opportunities for graduates and anthro-energy-related projects. The second day offered five thematic workshops focused on conflicted moralities of energy consumption (Energethics), building corporate cultures of sustainability (The Culture Academy), enculturing skills for renewable energy (The Low Carbon Energy for Development Network), adapting value of reflexive thinking (ASA Network of Applied Anthropologists), and exploring history of mining (Department of Anthropology). On the second day of the event (29 October), i.e. after the thematic workshops, the EASA Applied Anthropology Network held an annual meeting. There were approx. 30 people at the meeting, which shows that the network is active and there is enough interest of members to join its activities. First, we evaluated the 2017 edition of „Why the World Needs Anthropologists“. Second, we started forming an extended organising team for 2018 event, which will be held on 26 and 27 October 2018 in Lisbon, Portugal. Third, Meta Gorup and Dan Podjed reported about other network activities, including the online media. Fourth, the network elected a new network convenor, Verónica Reyero, who will formally join EASA in 2018, and a new network manager, Pablo Mondragón Valero – since according to the rules only EASA members are eligible to vote, both candidates received 8 votes out of 8 EASA members present at the meeting. Fifth, we discussed about other relevant topics, including how to motivate network members for participating more actively in network events, meetings and other activities; the participants of the meeting also discusses about possibilities and opportunities to financialy support the future network events, e.g. by crowdfunding, etc. Why the world needs anthropologists 2016: Humanise IT! 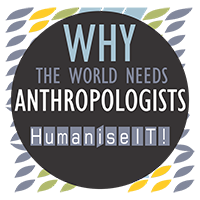 On 4 and 5 November 2016, we co-organised (in collaboration with nine other institutions from Europe and the United States) the fourth symposium Why the World Needs Anthropologists with a thematic title 'Humanise IT!'. More than 350 participants from 20 countries attended the main part of the event (4 November) and five thematic workshops (5 November). The purpose of the symposium was to promote applied anthropology in Europe, to encourage cooperation between IT engineers and anthropologists, and to present new possibilities for developing human-centred IT solutions. Keynote speakers at the event in Tartu, Estonia, were Sten Tamkivi, the founder of Teleport and former CEO of Skype, Melissa Cefkin, an anthropologist at Nissan, dedicated to the development of autonomous vehicles, Daniel Miller, professor at University College London (UCL) and an expert in digital media, and Dimitris Dalakoglou, professor of social anthropology at VU University Amsterdam. All four speakers participated in the panel discussion, which was moderated by Dan Podjed in his role as convenor of the EASA Applied Anthropology Network. Video-recording of the plenary part of the event was sponsored by our media partner, Postimees, and is available on this link: www.uttv.ee/naita?id=24871 The five well-attended thematic workshops on the second day of the event (attended by approximately 150 participants) were organised by Garage48, Antropologerne, DriveGreen project, ID:CO LAB of the IADE Creative University, and AnthroAnalysis at the University of Copenhagen. 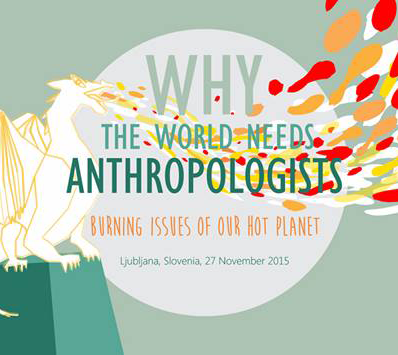 On Friday, 27 November 2015, Ljubljana (Slovenia) hosted the third international symposium ‘Why the world needs anthropologists’, with the theme ‘Burning issues of our hot planet’. The main purpose of the symposium, attended by 400 participants from around the globe, was the integration of anthropological knowledge and skills with other scientific areas as well as business, governmental, and non-governmental sectors. Exciting presentations in TED style were given by well-known speakers presenting their views on resolving the vital issues our society is facing. The symposium was organised by the EASA Applied Anthropology Network, Research Centre of the Slovenian Academy of Sciences and Arts, VU University Amsterdam, University Campus CIELS Padova, Slovene ethnological and anthropological association KULA, and University of Delaware. Sponsors of the event were Comtrade and EASA. Media partners were the publishing house Delo, magazine Razpotja, and web portals Metina lista and Tromba. 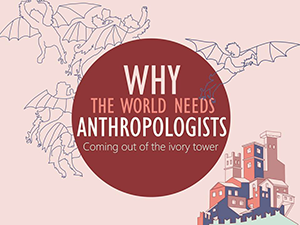 In the beginning of December 2014 the Italian city of Padua hosted the second international symposium Why the world needs anthropologists, which was attended by more than 200 visitors from Europe and beyond. At the event, annually organised by the Applied Anthropology Network of the European Association of Social Anthropologists (EASA) in collaboration with various institutions, the speakers and the audience tried to find out how to establish cooperation between academic and applied anthropology. The event was opened by Vanda Pellizzari Bellorini, Padua mayor’s advisor, and Simone Borile, president and director of University Campus CIELS, who expressed a welcome to the crowded auditorium at the Cultural Centre Altinate / San Gaetano in Padua city centre. The participants then embarked on a journey which took them from risky undertakings of Antonio Luigi Palmisano, Italian professor of social and economic anthropology at University of Salento, through daring business challenges of Rikke Ulk, anthropologist and CEO of Danish consultancy firm Antropologerne, to getting acquainted with open ecosystems which help improve user experience, which were introduced by Michele Visciòla, co-founder of Turin-based company Experientia. Diverse insights into the practical work of anthropologists continued during the heated panel discussion which was moderated by Dan Podjed, coordinator of the EASA Applied Anthropology Network. Apart from the three keynote speakers, the discussion featured Desirée Pangerc, applied anthropology lecturer at University Campus CIELS and Italian army lieutenant, and Peter Simonič, observer and initiator of political change and assistant professor at the Faculty of Arts of University of Ljubljana. The international symposium is a result of collaboration between Slovenian, Italian, Dutch and international institutions. Besides the main organiser, the EASA Applied Anthropology Network, this year’s event was organised by University Campus CIELS, University of Ljubljana, Research Centre of the Slovenian Academy of Sciences and Arts, VU University Amsterdam, and Slovene Ethnological and Anthropological Association KULA. The symposium was sponsored by the Slovenian Research Agency. In addition to his successful academic career, the first speaker, Antonio Luigi Palmisano, has acted as advisor at numerous international and civil missions in Africa, Latin America and Asia. He explained that anthropologists in conflict zones can play a crucial role in mediating between government authorities and ethnic groups with their own legal systems. From 2002 to 2004, Palmisano worked in Afghanistan where he operated as an intermediary between the government and minorities, and aimed at reconciling peoples who have for decades lived in midst of armed conflicts. He considered himself as successful at his tasks, also because establishing dialogue and mutual understanding is simpler than we usually imagine it to be – however, his undertakings were frequently hindered by the “higher” aims of the capitalist system which is supported by lawyers’ lobbies. He emphasised that anthropologists should fight against the existing system and encourage democratic and legal state in the regions where such arrangements seem to be utopic at the moment. The next speaker took the symposium in Padua to a rather different sphere. Rikke Ulk is CEO of Danish company Antropologerne which has carried out consultancy for numerous Danish and international organisations, among others in the field of healthcare, education, technology, employability, energy, and food. While transferring her anthropological knowledge and skills into business practice she learnt that “the world needs anthropologists because we make sense, we care, we have a vision, and we engage people.” To successfully engage people into the analyses, good communication is crucial; however, asking the right questions is of similarly vital importance. Rikke Ulk believes that companies can also contribute to improving our living conditions, but only if their questions reach beyond their desire for profit – and anthropologists are the ones who can help them with asking the right questions. The third speaker was Michele Visciòla from consultancy Experientia which strives for improving user experience in the fields of technology and innovation. Although not formally trained as an anthropologist, Visciòla fully understands the importance of anthropological approaches and ethnography in enhancing user experience. He stressed that “technological innovation is ‘simple.’ It is difficult, though, to create connections that really work in a given technological ecosystem. Our role is to create conditions which allow ecosystems to collaborate.” In his view it is only open systems that enable experimentation and they are therefore crucial for future technological development. Where are the boundaries of autonomy? The concluding discussion, moderated by Dan Podjed, coordinator of the EASA Applied Anthropology Network, opened a number of burning topics. The guests stressed, for example, that anthropologists are always employed by somebody, be it the state, an international mission or a multinational corporation, which in either case influences their work and the level of their autonomy. They also emphasised some of anthropologists’ weaknesses which become particularly visible outside the academic sphere: their reactions are often slow and their answers complicated, while customers expect quick, direct and precise answers. It is therefore very important to collaborate with experts from other fields who can offer fresh insights and help in adjusting anthropologists’ approaches. As Rikke Ulk summarised: “Anthropology is and should be an open ecosystem ready for inclusion and experiment.” Desirée Pangerc drew attention to the fact that anthropologists often give an impression of inaccessible intellectuals while their crucial tasks actually consist of establishing contacts between people which can enable collaboration and mutual understanding. Peter Simonič drew attention to anthropologists’ key role in local contexts. They can provide valuable insights and, in doing so, help people understand their environments and encourage new initiatives for positive change. The second international symposium Why the world needs anthropologists showed that numerous European anthropologists have already left the academic ivory tower and that their numbers keep growing. As implied by the event’s graphic design, an interpretation of Giotto’s fresco The expulsion of the demons from Arezzo, European anthropology has slowly but persistently been expelling its demons from the past, which are preventing the discipline’s development. It seems that anthropologists’ interest for applying anthropological knowledge outside the academia is growing. The next step, however, will require that anthropology convinces others about its usefulness – and this is precisely one of the important goals of the next symposium which will take place in 2015 in Ljubljana, Slovenia. 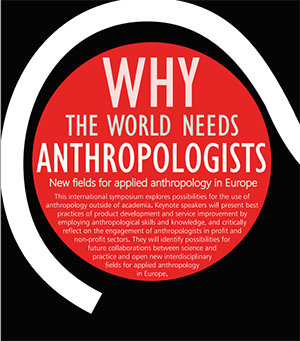 The first EASA Applied Anthropology Network symposium, entitled Why the world needs anthropologists, which took place on 29 November 2013 at Tropenmuseum Amsterdam, offered several answers to the burning question posed in the event’s title. The event attracted nearly 200 guests from all over Europe and featured three world-famous applied anthropologists: Anna Kirah (Making Waves, Norway), Jitske Kramer (HumanDimensions, the Netherlands), and Simon Roberts (Stripe Partners, United Kingdom). Their inspiring speeches were followed by an intriguing panel discussion moderated by Dan Podjed, the coordinator of EASA Applied Anthropology Network. The guests of the panel discussion were a motley crew of (more or less) applied anthropologists and experts who closely collaborate with them: professor Rajko Muršič from the University of Ljubljana, professor Marina de Regt from VU University Amsterdam, head of Tropenmuseum’s curatorial department Wayne Modest, Dutch anthropologist and journalist Nadia Moussaid, and Gregor Cerinšek, researcher and project manager at Institute for Innovation and Development at University of Ljubljana. The event in Amsterdam was a result of collaboration between several Slovenian, Dutch, and international institutions. In addition to EASA Applied Anthropology Network, the event was organised by VU University Amsterdam, University of Ljubljana, Dutch Anthropological Association, Tropenmuseum, and Institute for Innovation and Development of the University of Ljubljana. Sponsor resources were provided by Dutch foundation Vamos Bien!, Slovenian Research Agency, and Slovenian company Metronik. The realisation of the symposium was taken care of by students of VU University Amsterdam Department of Anthropology, Dan Podjed from University of Ljubljana, Ellen Bal and Rhoda Woets from VU University Amsterdam, and Meta Gorup from Ghent University. The event was opened by Dutch anthropologist Ellen Bal, professor at VU University Amsterdam who greeted the full Tropenmuseum hall. There were anthropology students and graduates among the audience, as well as many established (applied) anthropologists, joined by representatives of other disciplines interested in collaboration with anthropologists. Ellen Bal rightly recognised that such a numerous and diverse response signifies that anthropologists’ mission is a key question demanding an immediate answer. The first speaker, world-famous design anthropologist Anna Kirah who started her career in leading companies such as Microsoft and Boeing and is nowadays chief experience officer (CXO) in Norwegian company Making Waves, already offered several supportive answers to the question why the world needs anthropologists. She encouraged anthropologists not to be afraid to fly over the edge and reach out of the academia. In her opinion, anthropologists’ task is to facilitate change while remaining humble and aware that we are not experts. Despite this – or exactly because of it – we can involve experts themselves in the change process. By doing so, they become crucial in service and product improvement. Convinced of its benefits, Anna Kirah always employs human-centred approach and advocates for creating technologies, applications and objects not only for the people but with the people. In her opinion, this is why the world needs anthropologists: because they are trained in comprehending diverse points of view and know how to intertwine seemingly unrelated aspects. The first speech was followed by the lecture of Dutch anthropologist Jitske Kramer from the institution HumanDimensions which operates in the spheres of diversity, intercultural relations, and organisational change in companies. As the previous speaker, Jitske Kramer also emphasised that as an anthropologist she cannot be the organisational change but she can facilitate change by enabling organisational members to understand everyday events and activities. She believes it is possible to change the system but this can only be achieved by understanding the system and not by destroying it. To be able to do so, studying a company’s organisational chart and conducting a thorough business analysis does not suffice. It is necessary to find out how relations between organisational members are formed and what their influence on the business is. The next step represents the major challenge – how to introduce organisational change in an inclusive manner, that is, in a way that is agreeable to organisational members. In her opinion, the only way to carry this out is by understanding why people act and do things the way they do, and why we would like to change this in the first place. After all, the aim of change is to connect people in their diversity, and this is a task that fits anthropologists’ skills perfectly. The last speaker was Simon Roberts, British business anthropologist with more than ten years of experiences in technological research and strategic development – including international technology corporation Intel – who recently established a consultancy company Stripe Partners. Roberts presented a very optimistic perspective on the anthropologists’ role in a constantly changing world. In his view, anthropology’s mission is to time and again offer solutions for seemingly self-evident challenges which we face on a daily basis, such as obesity and ageing of society. This process is impeded by differentiation between academic and applied anthropology which is why anthropologists should strive to forget about this ‘unnatural’ division. Only if done so, anthropologists are able to offer the best solutions to the world. The symposium concluded with a panel discussion moderated by Dan Podjed. He started the debate with the question whether anthropology will be faced with the same future as the bird dodo which was extinct in the 17th century. The panellists’ answers revealed that they foresee a brighter future. Wayne Modest, the head of curatorial department at Tropenmuseum, an institution that traditionally employs anthropologists in an applied sphere, emphasised that the museum’s task is to introduce problematic issues to broader public and not only to generate knowledge. Marina de Regt, an anthropologist from VU University Amsterdam, cooperated with non-governmental organisations in Yemen. Although this is an applied field which often employs anthropologists, she developed a critical perspective on the so called “developing aid”. Dutch anthropologist Nadia Moussaid works at the TV station AT5. Knowledge gained during her anthropology studies affects the choice of topics she chooses to report on and often helps her with putting herself into other people’s shoes. Rajko Muršič, professor at University of Ljubljana, emphasised the importance of transfer of anthropological knowledge into practice. In his view, applied anthropology should simultaneously also be engaged and vice versa because this is the only way that enables anthropology to address and solve critical issues. Gregor Cerinšek from Institute for Innovation and Development of the University of Ljubljana is not an anthropologist but he often collaborates with them in multidisciplinary teams. He contended that anthropological contributions are always welcome when working in such teams. The panel discussion concluded with a topic very common at anthropological meetings – ethics. This issue noticeably upset the audience and provided a guarantee that the debate about why the world needs anthropologists and in what ways anthropologists should be engaging into solving problematic questions would continue during the reception taking place after the symposium. The symposium in Amsterdam did not provide a final answer to the question of anthropology’s future but it undoubtedly showed that a lot can be achieved with anthropological knowledge and skills, and that the common accusations of anthropology’s larpurlartism do not hold true. Anthropology is a discipline crucially needed for understanding the contemporary society and enabling positive change, therefore it is not even close to facing dodo’s destiny. Quite the contrary: anthropology’s applied branches are increasingly growing also in Europe. Therefore, anthropology’s future should be compared to a renaissance characteristic of the mystic bird phoenix.